I own a 1992 strada and it looks great, has the old truck body style of sharp corners. THESE NEWER TRUCKS WITH THE CANOPIES LOOKS LIKE A DOG TURD ON WHEELS, I WOULD NEVER EVER BUY ONE, BUT THATS JUST ONE MANS OPINION. I really like those trucks! I don't know what Mitsubishi Canada are waiting for to bring us those cool pick up! The nearest country where they are available is mexico, the L200. Beginning in January 2009, under NAFTA UNRESTRICTED 10 year old auto imports are permitted from Mexico with the age requirement dropping one year every January thereafter until new vehicles are permitted. Common here, and slick looking for certain. There were 2 such canopies in front of the office yesterday, but they were on Hilux's. Do look much better on the Trition, even more so on the solid colored Mitsu trucks for some reason. 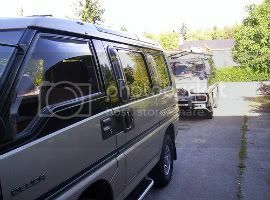 Some toppers have a hatch that locks open for shade and head room for the passengers riding in the back. I'll grap a phone snap of the next nifty looking one I see. I quite like the look of them too but they don't seem very functional. I get having a truck over a van because you can put tall items in the back but I don't get a truck with a canopy. Then this truck has about a 4' box. Why not get an suv!? It's not as if a 4' box is more useful for anything except carrying something like a fridge. Trucks are still handy to haul stuff. Im not a fan of putting say a load of firewood for camping in the back of a SUV. You just throw your junk in and go. Canopys are great because you can sleep in them (that one looks climate controlled) much easier than folding seats and moving all your gear outside. It is also probably alot lighter than say a delica or SUV when you arn't carrying 7 passengers. I'd take those over the Nissan Frontiers any day. Tacoma, not so sure. ...I'd take those over the Nissan Frontiers any day. Tacoma, not so sure. Between the mid-sized trucks, I definitely preferred the looks of the Tacoma over the Frontier. That being said, I preferred the look of the Nissan Titan over the Toyota Tundra - the Tundra looks like a cousin to a Dodge, don't quite know why. That being said, I ended up getting a Titan. Much nicer to have a box to throw things into, rather than the back of an SUV. Even with the canopy on, it's still better. And if need be, I can unclamp the canopy and load up even larger things. I like the look of the new Strada, and I tried to find a similar canopy for my Titan, but they seem to be an off-shore look only.